This is my first post about Magic, which I’ve been playing for years. If you have no idea what I’m talking about, I highly recommend this New Yorker article about the history and culture of the game or if you prefer audio, this episode of Planet Money from NPR, about how the game has managed to stay popular for over 25 years. Ever since Rivals of Ixalan came out about a year ago, Path of Mettle has been my favorite card to try to build around. It’s a finicky card that requires your deck to be stacked with the specific types of creatures it needs, but the payoff is that, once transformed into Metzali, Tower of Triumph, it’s “a one-card, synergistic game-ender,” as Craig Krempels put it. I can’t resist trying to make a card like that work. You see Field of Ruin rarely these days, Teferi, Hero of Dominaria can’t touch it, and it can take down a Carnage Tyrant. The one damage spread across the board by Path of Mettle entering the battlefield is also highly relevant in the current metagame, with a lot of one toughness creatures running around in mono-blue, white aggro, and token decks (it also hits Llanowar Elves in Sultai and Pteramander in Drakes). Of course the trick is, any competitive deck can’t rely on one card – you still need to be able to win without it, and I’ve been getting good results with this build, which I’ve been iterating on for a while. The abundance of one-drop creatures ensures there’s always pressure on our opponent. It’s worth reiterating that they will have a difficult time keeping up with our cheap creatures, and our number one goal is attacking as much as possible… In the old Ramunap Red decks, the scariest starts involved three creatures on the first two turns, followed up with cheap removal… The cheap creatures also make flipping Path of Mettle a sure thing… I liked the three copies of Path of Mettle a lot, as the single damage they sprayed around often had higher-than-expected value. Once flipped, Metzali is a one-card, synergistic game-ender; the opponent has no chance of attacking you without a large army, and every turn they don’t attack is a turn you can Shock the opponent. Of course, the over-powered cards from last year’s Standard are no longer available to us, like Hazoret the Fervent, which was a key card in Craig’s build. But without such oppressive cards available, the current Standard is one of the healthiest and most diverse ever, with room for innovation. The deck’s primary color is red, and I had a hard time coming up with 16 decent red one-drops, which are important for maximizing the early pressure on our opponents, and flipping Path of Mettle. I was running Ghitu Lavarunner for a while, but the deck lacks enough instants and sorceries to support it sufficiently. Goblin Chainwhirler, was a little too demanding on the mana base to reliably provide access to white mana early for casting Path of Mettle. Rekindling Phoenix in the main board was always a powerful card, but often felt a little too slow, and didn’t help out with flipping Path of Mettle. My deck was previously a two-color Boros deck, which basically meant I always lost to Esper Control, and usually to Sultai, with their multiple ways of wiping all my creatures off the board in a single stroke. So I splashed blue to get access to counter-magic in the sideboard, and that’s when I realized the way to go was all-in on Pirates (well, almost all-in). With a total of 17 pirates, Daring Buccaneer becomes a sufficiently reliable turn one one-drop (that’s fewer than the 20 pirates Frank Karsten recommends, but more than the 15 that Craig nonetheless did well with). We can support a playset of Lookout’s Dispersal in the sideboard, which is effectively an old-school 2-mana Counterspell in the early to mid-game, when it matters most for countering board-wipes or making sure Path of Mettle resolves. Captain Lannery Storm is a good card that never found a home in Standard, but I think she finally has one here. She helps flip Path of Mettle, and with the treasures she creates, she makes combat tricky for opposing creature decks, and provides often helpful mana-fixing and ramping (if control decks don’t deal with her quickly, she can accelerate us into a game-ending Banefire). The blue splash lets us play Storm Fleet Sprinter, to keep pressure on our opponents and help flip Path of Mettle. Also, between the Sprinter, Tin Street Dodger, Fanatical Firebrand, and our burn spells, we can almost always cast Light Up The Stage for one red. While Aurelia, Exemplar of Justice is no Hazoret, she’s still quite powerful, synergizes well with all the small creatures (especially the Sprinter and Dodger), and can get us through the mid-game, which often becomes the end of the game. Other red decks deal with opposing small creature decks with Fiery Cannonade, because no one is playing Pirates, right? It’s useless against us, but for us is quite effective from the sideboard. I’m running 4 copies of Path of Mettle, instead of the 3 that’s typical for Legendary cards, so that: we can maximize our chances of seeing it early (as we have nothing quite like Hazoret to fall back on); the extra source of mana of any color can be helpful early; with all the counter-magic in the current metagame, we may want more than one shot at casting it; and the 1 damage it sprays around is also very relevant in this metagame. The sideboard options are great, and I’ve included mostly what you’d expect for a Jeskai creature deck. The one recent addition I’m experimenting with is Dovin, Grand Arbiter. Casting him is a little risky, as he relies on both our splash colors, so the card is a one-of. But he rewards decks that go fast, it’s pretty easy for us to capitalize on his +1 ability, and planeswalkers have a habit of demanding your opponent’s attention. He may even end up in the main deck – we’ll see how it goes. Win or lose, the deck is always fun to play. I’m pretty sure all the human pirates in the deck are women – kudos to the designers for providing diversity here. So is Aurelia, which is just about the only thing I imagine an angel might have in common with a bunch of pirates. I’ve played several games now where my opponent reflexively brought in Fiery Cannonade from their sideboard, and then eventually realized they made a big mistake (usually before casting it, but sometimes after). Fanatical Firebrand is one of my favorite cards in the game. I have to try not to laugh every time I look at the artwork. In 1995 I photocopied this ad from a 1966 issue of Time magazine. I was in grad school doing some research on the Vietnam war, and couldn’t help but notice it. It’s almost as over the top as the old Saturday Night Live fake ad for speed. I thought I lost the photocopy years ago, but found it in a box in my basement the other day. Note to Mothers: Exhaustion may be dangerous – especially to children who haven’t learned to avoid it by pacing themselves. Exhaustion opens the door a little wider to the bugs and ailments that are always lying in wait. 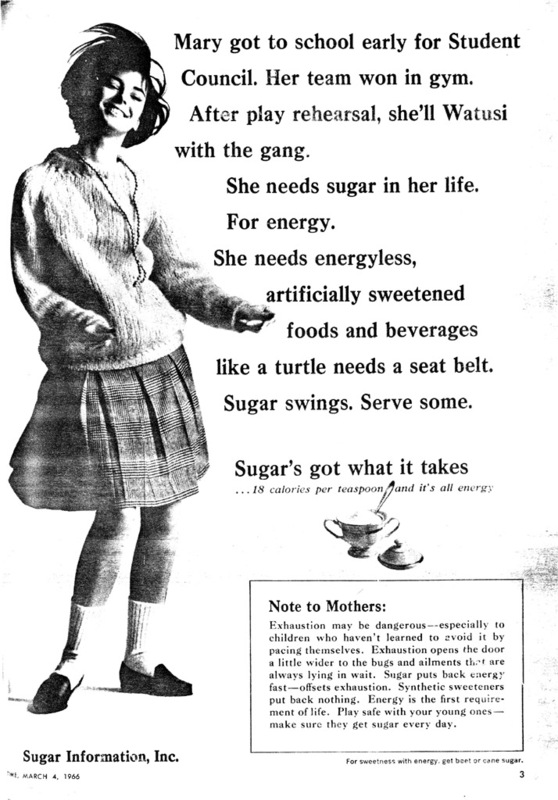 Sugar puts back energy fast – offsets exhaustion. Synthetic sweeteners put back nothing. Energy is the first requirement of life. Play safe with your young ones – make sure they get sugar every day. Memento: but instead of the story unfolding in reverse, it unfolds in a completely jumbled sequence, going from 2012, to 1982, to 2009, to 1975, and then back to 2012. If you enjoy a movie that calls for your active mental participation, and you appreciate the movie maker’s attention to detail in making all the seemingly disparate threads of a story mesh together, then Fish Story is for you. Anvil! The Story of Anvil: except instead of a story about a briefly famous band that falls into obscurity, the band in this story, Gekirin, goes from obscurity to oblivion. They write a punk song in 1975 that is ahead of its time, that almost no one appreciates, but ultimately is the key to saving the world (yes, punk rock can save the world, and fortunately, they actually wrote a great track for the movie). Armageddon: in 2012, the destruction of life on earth by asteroid is imminent. Last ditch attempts to save humanity, involving space ships and nuclear warheads, are involved. If you’re wondering what a forgotten punk rock song from the 70s has to do with saving the earth from an asteroid 37 years later, well you’ll just have to watch the movie! The Karate Kid and Power Rangers: a young man who isn’t sure why his father forced him to endlessly practice martial arts as a child finally finds his purpose. High Fidelity: the cool record store owner in this movie has the same encyclopedic knowledge of music as John Cusack’s character, but his sadness does not come from girl troubles. If You Give a Pig a Pancake (which is a children’s book, not a movie): after watching Fish Story, you might start thinking about causality, conditionality, and contingencies, but all I could think of was this book. Each step in the story makes sense by itself, but they all add up to a crazy spectrum of events. Although the idea of Fish Story is more than a little silly, its conceit is not. At its heart, Fish Story is about how music can connect with people and change their lives in unexpected and amazing ways. It shows how music can give us courage and hope, and challenge us to make ourselves and those around us better. It shows how a song, a stupid little song that almost no one in the world knows about, can drastically affect and change for the better the lives of people who have never even heard it. And when you think of it like that, it’s not hard to imagine that a song could, somehow, actually save the world someday. Unlike modern American movie trailers that summarize the whole movie for you, the Japanese trailer for it gives you a sense of the movie without giving away the story (with subtitles). 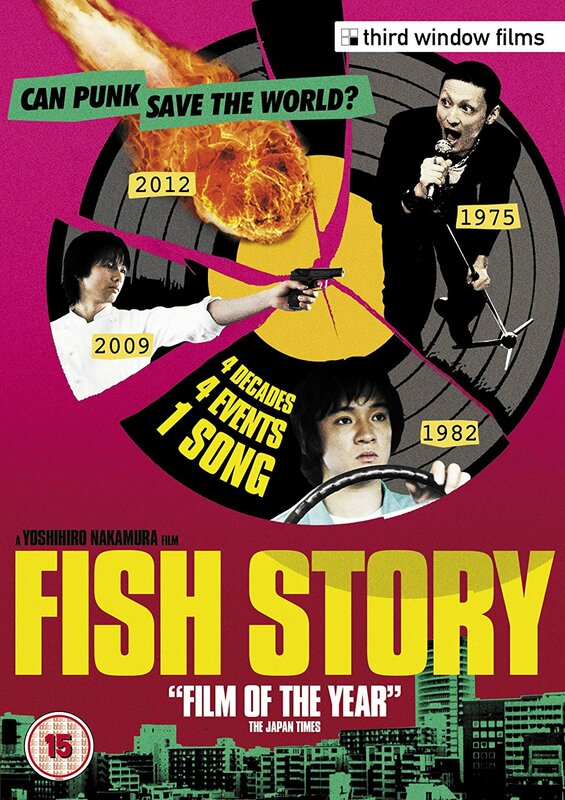 Unfortunately, it’s currently not available on Netflix streaming, but it used to be, and may come back in the future (here’s the Fish Story streaming page on Netflix if you want to check). Netflix does have it on DVD. It may be on other streaming services – there are several movies with this name, so definitely make sure you’re looking for the Japanese one. If you have the misfortune of visiting Tokyo for only a few days, you’ll find it hard to decide where to spend your time in a city that has so many amazing things to see and do. A good way to get a sense of the traditional, slower-paced Tokyo, as well as the modern, fast-paced Tokyo in a single day is to venture to the northeastern district of Asakusa in the morning, with its temples and buildings dating back to the 1950s (Tokyo was essentially leveled in the WWII fire-bombings, so the 50s is considered old for Tokyo architecture). Then take a cruise south on the Sumida river, which will take you under about a dozen architecturally distinct bridges. The cruise ends on the man-made island of Odaiba in Tokyo Bay, which offers endless attractions for modern shopping and hi-tech fun, and even a sandy beach. At the end of the day (or night), head back to the mainland on the Yurikamone line, which does an entirely gratuitous 360° loop as it crosses the river, giving you a panoramic view of eastern Tokyo. Cherry blossoms on the waterfront in Asakusa. The first nice weekend after the blossoms come out is a traditional time for the Japanese to picnic under the cherry trees. Asakusa is… most famous for the Sensō-ji, a Buddhist temple dedicated to the bodhisattva Kannon. There are several more temples in Asakusa, as well as various festivals… For most of the twentieth century, Asakusa was the major entertainment district in Tokyo… In its role as a pleasure district, it has now been surpassed by Shinjuku and other colorful areas of the city… It is central to the area colloquially referred to as Shitamachi (not an official designation), which literally means “low city,” referring to the low elevation of this old part of Tokyo, on the banks of the Sumida River. As the name suggests, the area has a less frenetic and more traditionally Japanese atmosphere than some other neighborhoods of Tokyo… In keeping with a peculiarly Tokyo tradition, Asakusa hosts a major cluster of domestic kitchenware stores on Kappabashi-dori, which is visited by many Tokyoites for essential supplies. Next to the Sensō-ji temple grounds is a small carnival complex with rides, booths, and games, called Hanayashiki. The neighborhood theaters specialize in showing classic Japanese films, as many of the tourists are elderly Japanese. Asakusa is a part of Tokyo whose glory days are behind it, but still has a lot of old city charm, and continues to draw tourists as well as Tokyoites looking to spend some time away from the fast-paced modernity that defines most of Tokyo. If you visit during cherry blossom season, the park along the river will be packed with people having picnics to celebrate the start of Spring. At the start of the cruise, you’ll see the Asahi beer buildings, designed by Phillipe Starck. The one on the right is supposed to look like a head of foam on a beer, but has been nickname the golden turd. The river cruise boats depart from the Asakusa wharf. Don’t be shy about asking someone where it is. Plenty of people speak English, and if you’re not too far from it, someone may even walk you right to it. There are multiple destinations so make sure you’re getting on a boat headed to Odaiba! The cruise lasts about an hour, and takes you along the eastern side of Tokyo, so you’ll see a lot of interesting buildings and bridges. japan-guide.com has a helpful overview. Odaiba is a cross between Disney World and Las Vegas: it has all the lights and dazzle of both, but is more family-friendly than Vegas, and has a lot more fun activities for adults than Disney World. Japan-guide.com has a good overview of Odaiba’s multitude of attractions. It was a frequent destination for the boys and I when we lived there in 2007. From where we lived in Shinagawa, Odaiba was only one stop away on the Rinkai Line. The boys especially loved the Toyota MegaWeb complex, the Palette Town video arcade, and the parks and beaches. The Yurikamone Line is an attraction itself, and is definitely the way you should depart Odaiba. It’s fully automated – there is no one driving the train – and the tracks run in a loop on the eastern edge of the river, giving you a spectacular view of the city. I’ve visited Odaiba about 20 times, and I still haven’t seen all of it (although that’s partly because the boys always wanted to do the same things every time we went). I’m recommending it for just a half day visit though, because it really will give you sensory overload. It’s worth a second half-day visit if you have time. This post includes pictures from 3 visits to Japan, in 1999, 2004, and 2007. As an American attending a Japanese major league baseball game for the first time, it turned out that the most fun part wasn’t watching the game, it was enjoying the highly choreographed, non-stop cacophony of alcohol soaked cheering and singing from the fans. The game itself was good, and was very much like watching two good major league American teams play. It was the Yomiuri Giants vs. the Hanshin Tigers, who have a long-running rivalry like the Yankees and Red Sox. The big difference from American baseball is the rituals the Japanese bring to the game. When you combine Japanese baseball fanaticism with their obsessions over convenience, cleanliness, and group activities involving alcohol, you get a unique experience. Convenience begins with buying the tickets – I didn’t buy tickets until the morning on the day of the game, so all that was left were standing room only tickets. But I was able to buy them at a convenience store for only 1000 yen (about $11) each. Convenience stores here sell tickets for just about every major event in the city, with no surcharges like those obscene TicketMaster “convenience” fees. Getting to the game is also convenient on the subway, which takes you within a stone’s throw of the Giants’ home stadium, the Tokyo Dome. I didn’t even see a parking lot – if there is one, it must be small. Cleanliness is apparent the moment you walk in the stadium. You’re allowed to bring in any food and drink you like, including alcohol. However, there are paper cup stations at every entrance, where you are required to give your drinks to a uniformed guard, who will pour them in cups for you, as they want to make sure all the metal cans and plastic bottles are recycled, and to minimize any mess. And there is no mess: every stairwell, hallway, stadium seat, and toilet is spotless. The stadium had an almost antiseptic feel to it, like a hospital: as an American, it felt utterly antithetical to any previous stadium experience of mine. I had to restrain a fit of laughter partway through the game, when a man sitting across the aisle spilled his beer (by then we had snuck into some empty seats in the nosebleed section behind home plate). Not only did he immediately get up and run to report the spill to a stadium attendant, the attendant than grabbed another attendant, and they rushed back to his seat with a pile of paper towels and a plastic bag to frantically clean it up. Like in the US, beer is the drink of choice for many at baseball games, but hard liquor is also for sale. The people working hardest during the game aren’t the players, it’s the beer girls. They’re all young and pretty (presumably a requirement for being hired), and they carry pony kegs on their backs, so they can serve draught beer. They are in constant motion, huffing up and down the steep stairwells, serving beer and dripping sweat, but always with smiles on their faces. It was like watching marines doing basic training, but high on happiness pills. I felt exhausted just watching them. I noticed none of the same girls were around for more than a few innings, so presumably (hopefully) they were allowed decent breaks. The most remarkable thing was the choreographed cheering, which started before the first pitch and went on continuously throughout the game (see the video above for a sample). Actually, there were a few brief breaks when the cheerleaders – yes, cheerleaders for baseball – came out to dance (so they should call them dancers instead, since they were definitely not cheerleading). The left outfield seats were occupied exclusively by the Toraki-chi (crazy Tigers fans), and the right outfield was for the Giants, and then fans for both teams were mixed together in the rest of the stadium. Each side had chants they sang when their team was at bat, and the other side mostly would stay deferentially quiet, except for especially good defensive plays. The stadium-wide coordination was impressive. Each team had a specific way to express their enthusiam for home runs. For the Giants, aside from an explosion of cheering, every fan has a small orange towel to wave, and in the center of their fan section were people waving two enormous flags (see the video below). Unlike in the US, nobody brings home-made signs. I thought it was all really a lot of fun for the first few innings, but by around the sixth inning the constant cacophony became numbing. But I wasn’t drinking, so that was probably a big part of my problem. Which reminds me, I did also pay some attention to the game 😉 The Giants clobbered the Tigers 10-2, mainly because the Tigers opening pitcher gave up 7 runs in the first few innings before they finally took him out. Here are the game’s full stats if you’re curious. Since I was still a bit jet lagged, it was a pleasant way to relax on the 4th of July, and have an experience that felt both American and uniquely Japanese.